So this is number 3 in Sony's cell phone line-up, the Sony Ericsson W380i Walkman Phone. Out of all the phones, this is probably the one with the most different design. The Sony Ericsson W380i Walkman phone is a flip phone but unlike other flip phones, at first glance, the Sony Ericsson W380i doesn't seem to have an external display. According to Sony, there's a "hidden display" that lights up when you receive a call or play music. Well, Sony did a good job hiding the display of the Sony Ericsson W380i since from the picture, I don't see any display, just something that looks like LED lights. 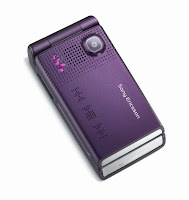 The Sony Ericsson W380i supports memory stick micro and has a 1.3 mega pixel camera. Sony boasts that the Sony Ericsson W380i has a Gesture Control that mute calls with the wave of your hand. How that's going to work we'll find out when this phone comes out in early 2008. Well the key lock doesn't actually work for the previous and next song buttons on the W380i. Car phone warehouse have tried to give me 3 different phones and all had the same fault. Now its a wait and see game with Sony Ericsson to see if they will actually fix my brand new phone!